We’ve uncovered a new Best Buy in the notoriously patchy world of sound bars, and also tested the cheapest Dolby Atmos sound bars seen in the Which? lab to date. In our July batch of models we also found three to avoid. Below we run through the models on test. We also explain what Atmos is and whether it’s worth paying for. Best Buy sound bars – pick the best one for your TV. JBL and JVC have made their respective 2018 debuts in our sound bar test lab, with three new products between them. JBL has two entries this time around. The cheapest, at £130, is the Bar Studio 2.0, which is a standalone sound bar with a built-in bass port, negating the need for a separate subwoofer. 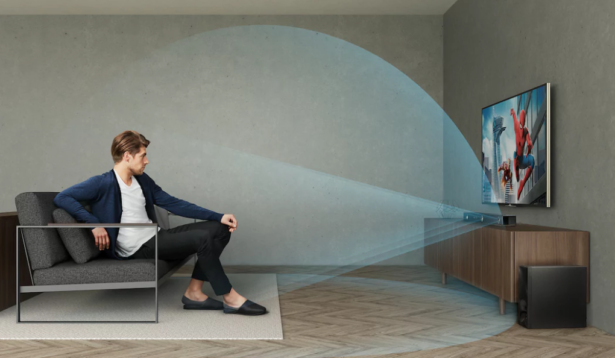 It’s a compact bar, meaning it’ll be suitable for smaller TVs, and it ticks several connectivity boxes including Bluetooth and HDMI ARC (audio return channel), the latter of which allows you to more easily connect multiple devices to your home cinema setup. Read our in-depth Bar Studio 2.0 review to find out how it performed in our tests. Also on test from JBL is the £250 Bar 2.1, which has a separate subwoofer. JBL claims this bar also manages virtual surround sound, although in the past we’ve found these claims to be patchy at best, so it’s worth reading our full Bar 2.1 review to see whether it’s up to snuff. Currys PC World-exclusive JVC starts its 2018 models on test with the £599 TH-D588B 5.1.2 sound bar. This premium model is compatible with Dolby Atmos. Atmos is the latest form of surround sound, which uses speakers (11 in this case) pointing in multiple directions to bounce sound off walls and ceilings to envelop you in sound (see below). The Dolby Atmos logo doesn’t always mean great performance, though, so read our JVC TH-D588B review for more. This batch of sound bars completes our testing of LG’s 2018 range of ‘SK’ sound bars. First up are the mid-range LG SK5 and SK5R. 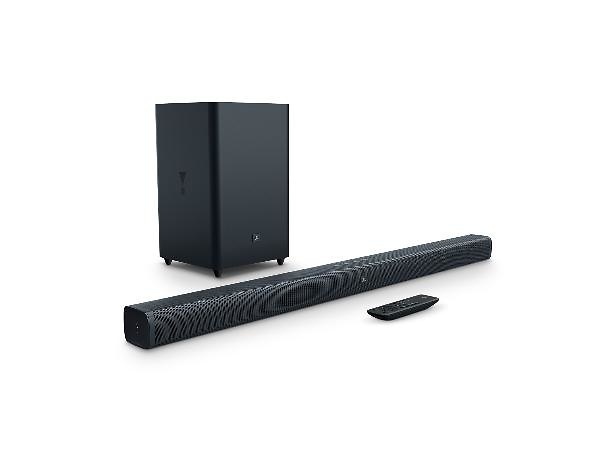 The sound bar and subwoofer elements of these products are identical, but the ‘R’ model comes with a pair of rear speakers to give you a flavour of surround sound. We’ve previously found that rear speakers in sound bars can actually detract from the sound – can LG buck the trend here? Read our LG SK5 and SK5R reviews. At the bottom end of the market, we have the back-to-basics LG SK1, which is the cheapest 2018 sound bar in LG’s range. This model costs just £99 but still comes with the basics you’d want for a simple home cinema setup, including an optical audio input and Bluetooth connectivity. We’ve seen as many stinkers at this price as surprise hits, so read our LG SK1 review to find out more. Finally, we’ve looked at the SK10Y, which is LG’s top-end model, costing £1,199. As you might expect, the SK10Y gets all the features you could possibly expect from a sound bar, including Google Assistant compatibility, Dolby Atmos, HDMI ARC and Bluetooth, and also claims to boost the quality of your sound using ‘upsampling’, which fills in the gaps in lower-quality audio tracks. Can a sound bar possibly be worth nearly £1,200? Our LG SK10Y review gets to the bottom of things. One of the biggest players in sound bars, Samsung, is releasing its sound bars a little more slowly than some rivals in 2018. There are still a few new models yet to be released, but we have two more on test in addition to the one that was tested in June. The HW-N450 is a £350 sound bar that has four built-in speakers, HDMI compatibility and a separate subwoofer for more powerful bass. It’s also compatible with external surround sound speakers if you want to add them at a later date. We’ve previously found this price point to be something of a sweet spot in terms of features and audio quality, so read our Samsung HW-N450 review to see whether this model hits the spot. We’ve also tested the £699 HW-N650. Samsung makes plenty of claims about the advanced audio tuning it’s applied to this bar, and also highlights its ability to deliver clear and crisp speech, which is something some larger sound bars aren’t able to do well. Read our Samsung HW-N650 review to see if its claims are met. 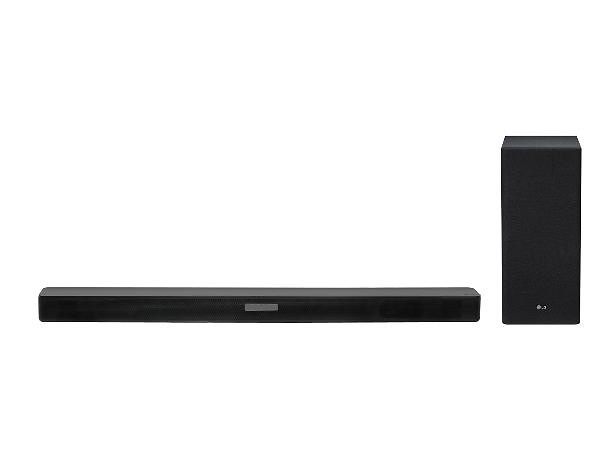 This sound bar from Sony is in the same price range as the Samsung HW-N650. It features wi-fi connectivity for music streaming, Bluetooth, two HDMI inputs and one output with HDMI ARC built in. There’s also surround sound and upwards-firing speakers that look to imitate Dolby Atmos without using the brand name. Sony calls it Vertical Surround Engine. Read our full Sony HT-ZF9 review for more. Sony’s marketing impression of its Vertical Surround Engine. Dolby Atmos is becoming an increasingly common feature on sound bars, although it’s still only on a minority of products – we’ve reviewed nine in 2017 and 2018. It also carries a huge premium, partially because sound bar brands want to show their most expensive speakers have extra features, but also because the number of speakers required to make Atmos work means the sound bars that have it are more expensive to make. The average price of a sound bar with Atmos on Which.co.uk is £905. Prices have come down recently: this batch of bars includes two sound bars with Atmos for under £599, which are the cheapest we’ve ever seen. 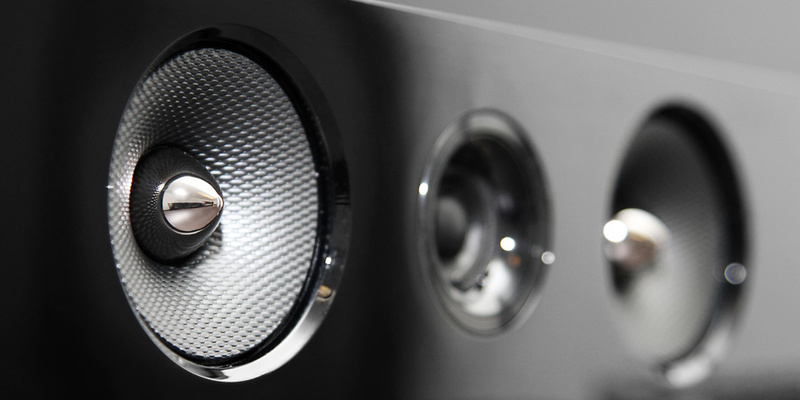 The intention of Atmos is to extend what surround sound systems are capable of. Instead of just getting directional sound that comes from the front and rear, and left and right, you also get the feeling of sound happening in the space beyond the speakers. On sound bars, this is mostly done with a combination of front, right, left and upwards-firing speakers that bounce sound off your walls and ceiling. A Dolby diagram of Atmos on a sound bar. It can sound great, according to our experts, and clever sound bars can calibrate themselves to the layout of your room to provide the best experience. But we’ve found it can be pot luck as to whether you get the full Atmos experience. For reference, our audio test lab spends several hours setting up its in-house benchmark Atmos system that consists of four speakers and a subwoofer. 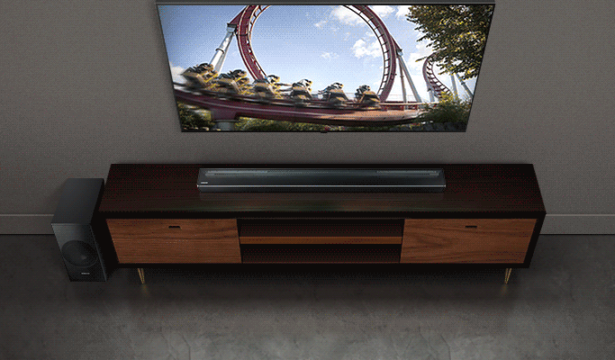 A sound bar takes mere seconds and doesn’t always get it right. Atmos is a feature that’s nice to have, but not essential, and it’s not an indicator of overall sound quality according to our tests. In fact, we’ve had several Atmos-enabled sound bars that have scored very poorly for sound quality. And even with Best Buy sound bars, Atmos isn’t always a reason to buy. We’ve found sound bars that are excellent everywhere but aren’t brilliant at Atmos. What’s more, if you’re just watching terrestrial TV, you won’t be able to get Atmos content anyway. Sky Q boxes are Atmos-compatible (depending on the content you’re watching), as are many Ultra HD Blu-ray players (you’ll also need Blu-rays that include an Atmos audio track) and Xbox One games consoles. Some Netflix TV shows support Atmos on some versions of its app, including LG OLED TVs from 2017 and later. It’s definitely worth checking whether you’re actually going to be watching Atmos content before shelling out on an expensive Atmos sound bar. 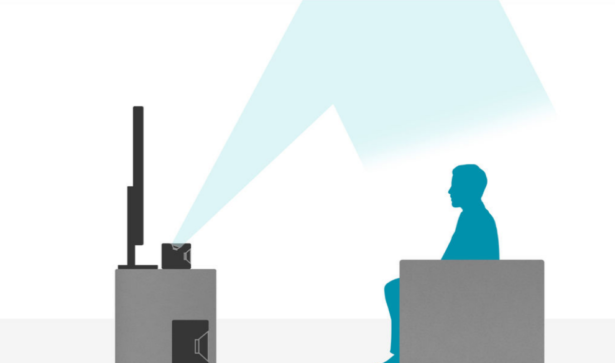 To make sure you get the best sound possible from your TV, read our guide to how to set up a sound bar with your TV. Sound bars vs home cinema systems: which is best?